Today I’d like to share with you some really cute cards from one of our 2017 Artisan Design Team members; Shannon Lane. Shannon took a stamp set that I didn’t look twice at and created these really cute cards that make me want this stamp set: Beetles & Bugs! 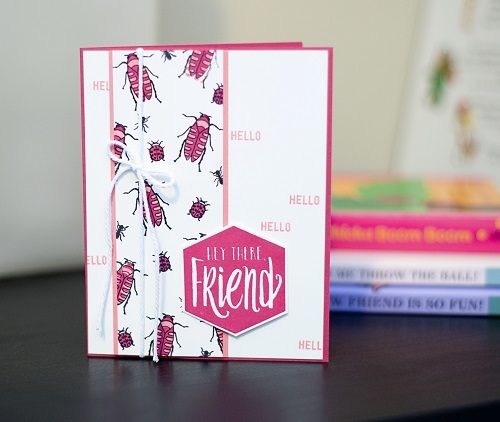 And just in case you have a little girl who likes bugs too …. 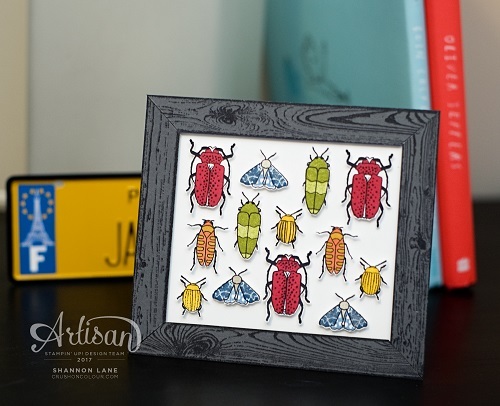 Thank you so much for stopping by today; I really hope Shannon’s cards inspired you to create with the fun stamp set full of bugs! Who knew. And Thank You Shannon Lane, our 2017 Artisan Design Team member for sharing the fun and coloroful cards. They really are Cute as a Bug! Yesterday I shared with you the “So In Love” bundle, what did you think? Pretty right! 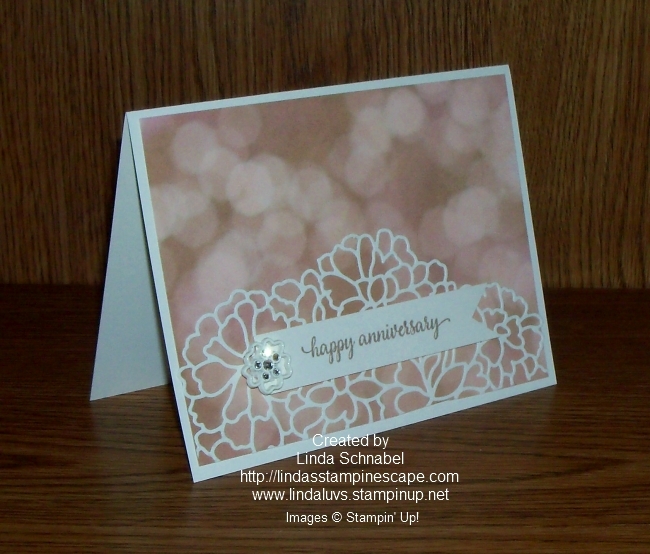 Well today I’m going to share a simply beautiful card that I created using the “So In Love” bundle. I began with with the largest of the dies and knew I just wanted it to highlight my designer paper. I knew I was going to use the Falling in Love Designer Series Paper so I chose the Very Vanilla cardstock as my base and cardstock to be die cut. I used the Precision Base Plate and die brush to cut and discard of the inner pieces with ease. 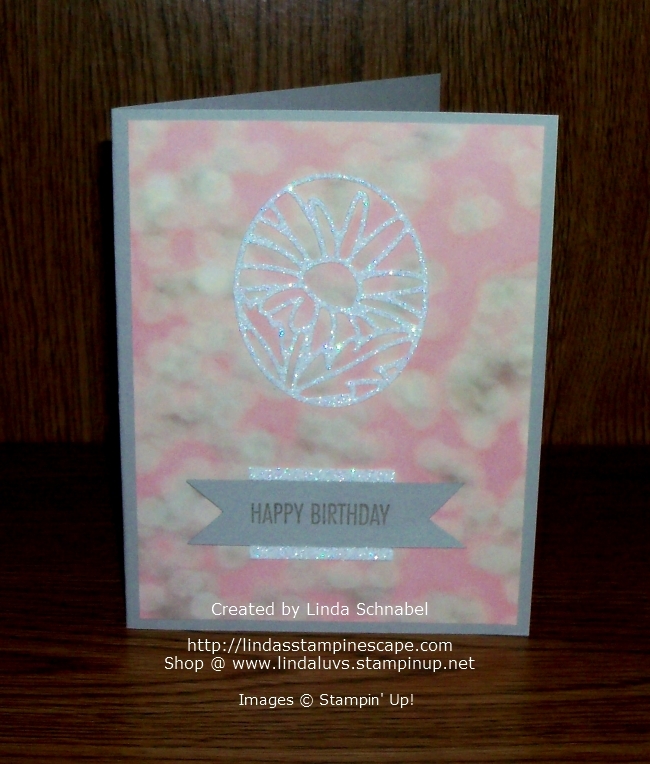 Next, I layered my designer paper onto my base, and then my die cut piece onto the designer paper. 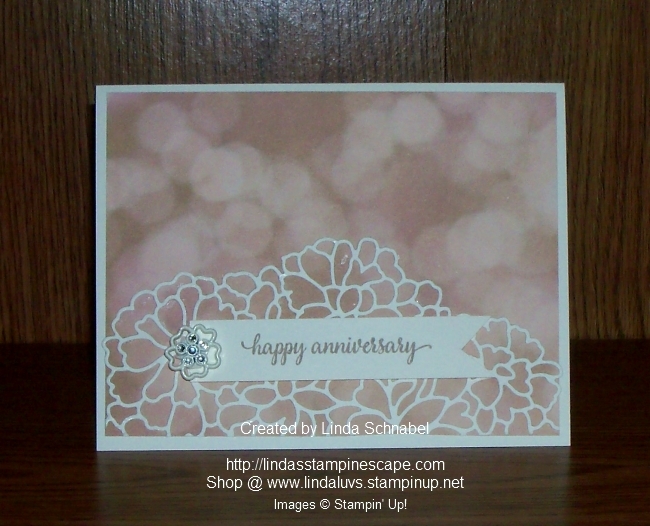 I then added my “Happy Anniversary” greeting which I stamped in Crumb Cake on my banner. I added the pretty little “Falling in Love” embellishment to anchor my banner and create and eye catching effect. How simple, and how pretty is this. You could use this card layout with so many of our pretty designer papers, and there are plenty more greetings to use in this stamp set. Hope you enjoyed … Thanks so much for stopping by today. 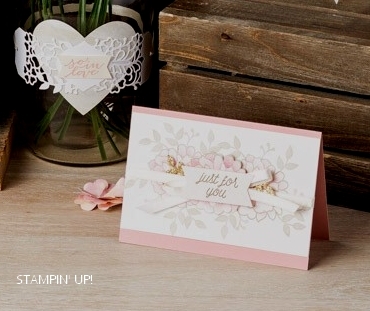 Carrie, from the training team at Stampin’ Up!, shares some beautiful project ideas and tips for using the So in Love Stamp Set and So Detailed Thinlits Dies from the 2017 occasions catalog. 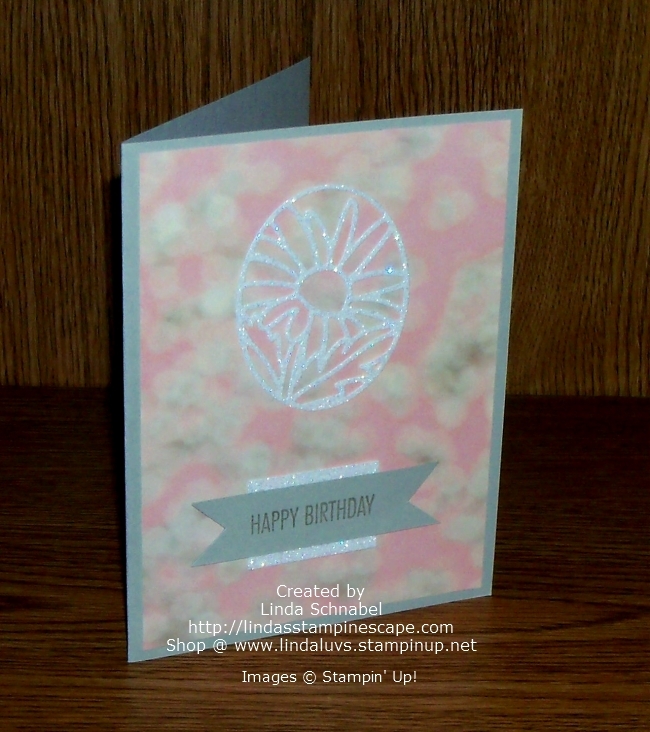 Here you can see the foliage stamp was used to create the background, then the flower was added to compliment the foliage and add some dimension. 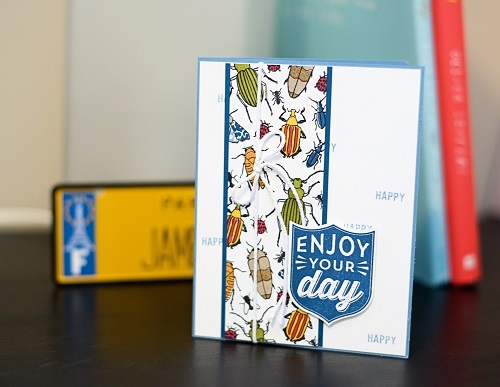 A pretty bow and an banner with the “just for you” greeting completes this card. Look at the jar in the background … it was wrapped with one of the delicate bands created from the dies. Below the die cut band was used again to turn this simple bag into a beautiful gift bag. If you love pretty, delicate items … this is the bundle for you. I can image all sorts of beautiful cards and gift packages that you could make for Wedding’s, Anniversaries, Mother’s Day … or a special friend. 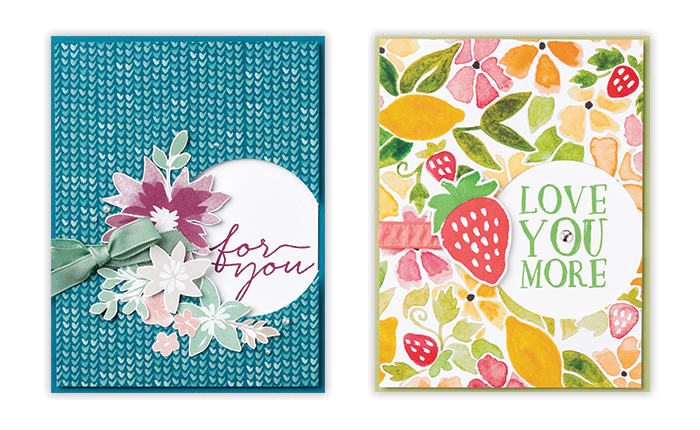 Our “For You” card uses the “Blooms & Bliss” Designer Series Paper and the “Love You More” features the “Fruit Stand” designer paper. Amazing how different the cards look even though they are using the same template (layout). I’ll be sure to post more samples from the great templates I had shared with you. Thanks for coming over to see my blog today. 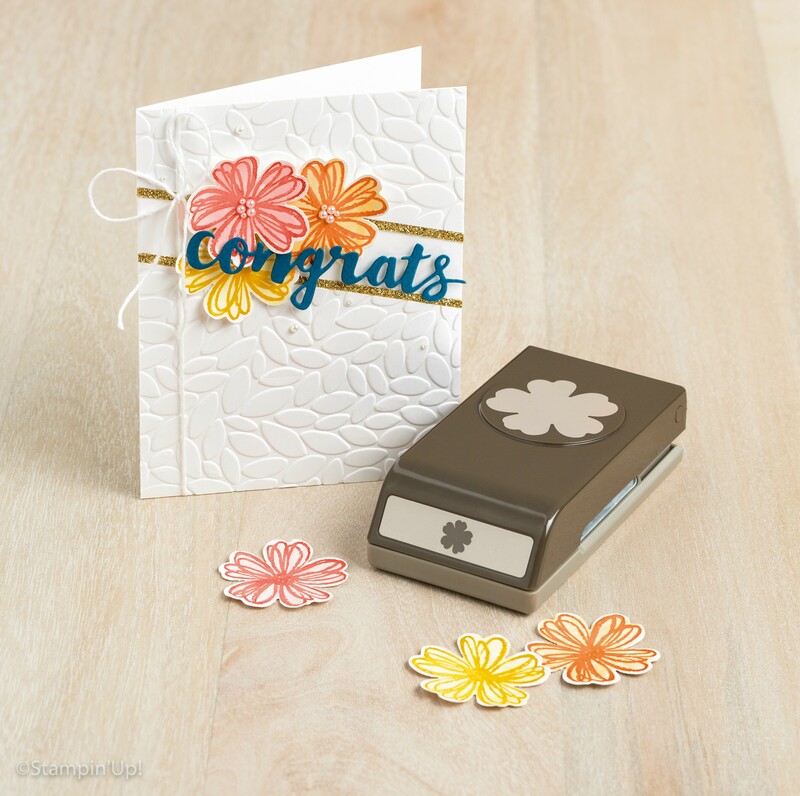 Many of my stampin’ community and fellow demonstrators are subscribers just for the exclusive stamp sets, because once you’ve completed the kit … you’ll still have a fabulous stamp set in your collection (and an ink spot / a small ink pad). Speaking of the ink spots … I collect them too because they are much easier to carry when I get together with fellow stampers. Here’s a card design with the components of this kit. 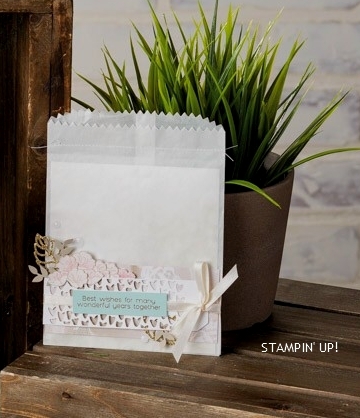 With a stamp set like this and a variety of embellishments, there’s no stopping your creativity! Add the pocket card you’ve created from the kit to a Petit Café Gift Bag with a Gold Binder Clip and you’ll have a gift ready to for a special occasion. You can create a gorgeous background and a simply elegant design. The style lends itself well to water coloring as featured on this card. I’d love to see what you create with your Bold Botanicals kit. 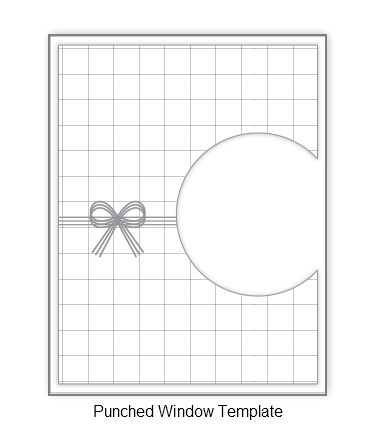 The refill kit is now available so you can keep on creating… but you must be a subscriber to purchase refill kits and past kits. NOW … is the perfect time First-time subscribers can buy their first month at regular price and get their second month FREE! Use promo code BOGO at PaperPumpkin.com by October 10. I hope you have an awesome day … and thanks for stopping by.